Since last January (2013), I’ve been working on an add-on for my teaching license that will qualify me for my current position as an Instructional Technology Specialist/Facilitator. This spring I had one assignment in my current class that gave me quite a bit of trouble. In fact, I made the lowest grade I’ve ever made on that assignment…I mean EVER! It’s all good though, I still have an A. 🙂 Anywho, the assignment was on the use of spreadsheets in the classroom. In the past, I’ve used spreadsheets to create basic gradebooks, budgets, and lesson plan templates, but I’ve never really thought about using them with the students. I’m the kind of person that I’m not not going to know something for long, so when I recovered from the shock of my grade, I became determined to learn more about spreadsheets in the classroom. Holy cow, have I been missing out! coloring lines and resizing rows and columns to create index cards, notebook pages, and journals. Since a spreadsheet can have multiple tabs, those are great ways of creating study aids and digital notebooks for your students. Here’s an image of an index card I created. use “if/then” statements to create “Guess and Check” activities for your students. Hide the actual answer in cell A1 and set the background color to the text color. The correct formula for an “if/then” statement is: =IF(what you’re testing, “true value”, “false value”). In the example below, I asked the question “How old is Mrs. Boucher?” I had three formulas that I used: =IF(C6>A1, “Too High”, ” “), =If(C6=A1, “Correct!”, ” “), and =IF(C6<A1, “Too Low”, ” “). Creating math review for basic facts or finding the average of a set of data using a spreadsheet. Print them out and have your students complete them. Show students how to use the basic formulas for addition, subtraction, multiplication, division, and average. Have a computer station set up where students can input the formulas and check their answers. By putting in the formulas, they’re cementing their procedural knowledge. Have students collect data on the latest tablets or other desirable electronic devices. Record the prices for each and have them use the MIN and MAX formulas to identify which one costs the most/least. Have students research different summer jobs that are available in your area. Input the data and use the MIN and MAX formulas to determine which are the best jobs. You could go a step further and use charts to compare pay per hour for the jobs to see which jobs offer the most money for the least amount of hours. Have students create databases using spreadsheets, then teach them to sort and filter to find the information that they need. I always stayed away from spreadsheets in the classroom because I really didn’t understand how they worked. As I continue to research and find more classroom activities that even the youngest students can do, I’m getting more excited about them. 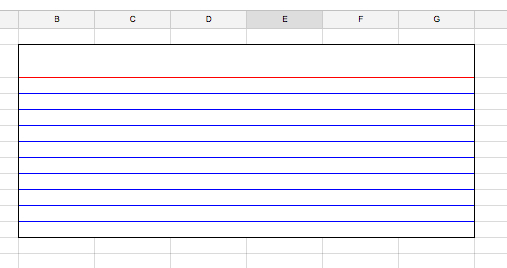 Have you creatively used Spreadsheets with your students? If so, how? Please share your ideas and experiences in the comments below.